Av. del Camino de Santiago, 40. Microalgae are cultivated in facilities called photobioreactors (PBR), which make use of light to produce biomass and byproducts. The PBRs used in INCOVER are tubular horizontal semi‑closed reactors, consisting in two lateral open tanks connected through transparent tubes. The total volume is 35 m3. The PBRs and their auxiliary elements were designed and constructed by the GEMMA Research Group (UPC) in collaboration with the company Disoltech S.L. The system was conceived as a combination of an open raceway pond and a closed tubular PBR, considering the advantages of both configurations: better pH control and protection against culture contamination, less evaporative loss and higher biomass productions due to the closed part; and dissipation of excessive dissolved oxygen in the open part. Agricultural wastewater is used as source of nutrients: 2.3 to 7 m3 of wastewater are treated daily and the obtained biomass is used for the production of biopolymers and bioenergy. Simple and low-cost technology for wastewater treatment. Feasible alternative for agricultural run-off treatment and mitigation of eutrophication in the receiving water bodies. Recovery of nutrients from wastewater for the cultivation of microalgal biomass usable for the production of bioplastics and bioenergy. Validation of tubular horizontal semi-closed PBRs for agricultural wastewater treatment and production of biomass (microalgae dominated by cyanobacteria) with high content of biopolymers. Treatment of wastewater and run-off from agricultural activities. Bio-plastics production has been made through a two-stage anaerobic-photosynthetic system, using anaerobic pretreatment and High Rate Algae Pond (HRAP) systems. 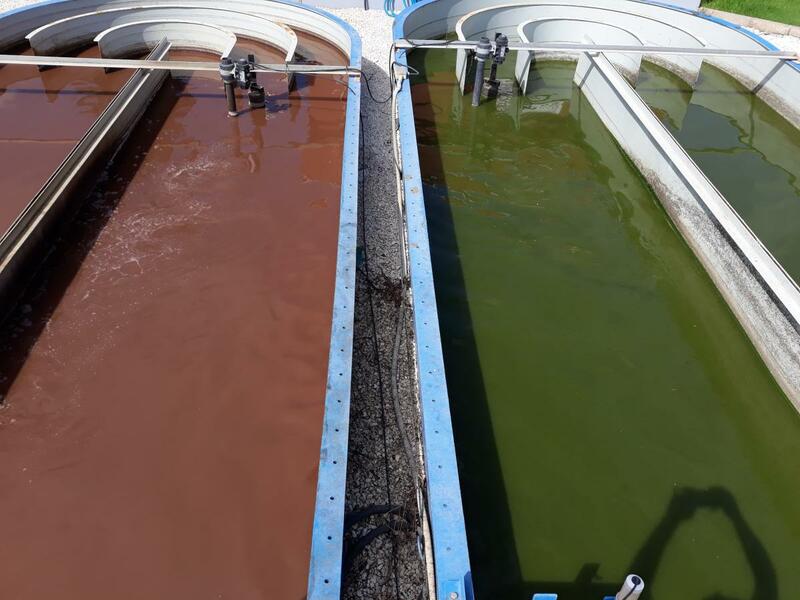 Project partner, IBET, performed PHA production lab tests using 2 PBR (photo-bioreactors) that simulate El Torno (Chiclana) wastewater treatment ponds, with two different mixing systems: jet mixing and paddle wheel. 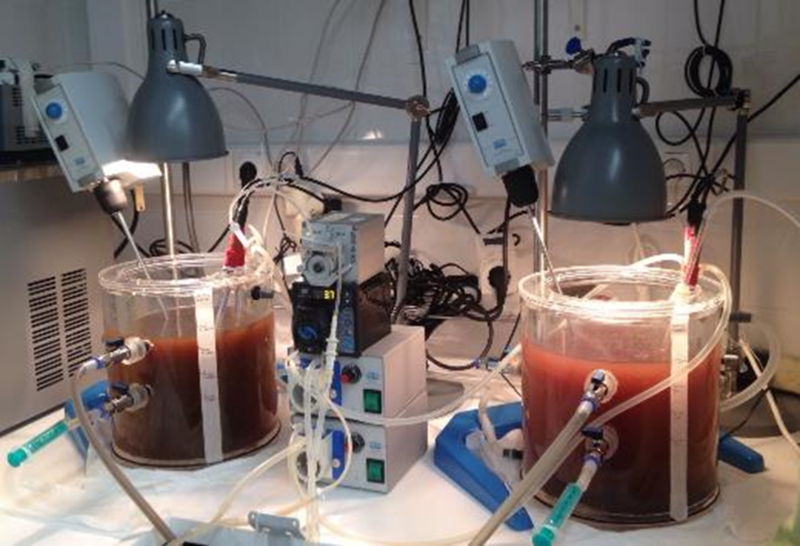 The tests have been conducted with real fermented wastewater from AQUALIA and results indicated a successful enrichment of the reactors with 15-20% PHA accumulating photosynthetic mixed cultures. PHA production at demo scale is currently being operated by Aqualia. Two UASB (Upflow anaerobic sludge blanket, 20 m3 each) fed with molasses and pretreated wastewater permit to obtain a fermented effluent. Then, two jet mixed ponds are being fed with the fermented waste and supplemented with fertilizer (N and P source). After several weeks of operation purple bacteria have finally been selected (see the left pond on the figure below). The process will be optimized in the following months. Right pond is still with microalgae dominance, as the starting up was two weeks later than the other one. Coupling of wastewater remediation to bio-plastic production permits the redefinition of waste streams as biotechnological feedstocks (Fradinho et al., 2013a). Use of mixed microbial cultures instead of the pure cultures and costly substrates which are used nowadays for Industrial PHA production. The application of mixed microbial cultures avoids the cost of sterilization equipment and the use of expensive refined substrates, as they can be operated in open systems and employ inexpensive industrial and fermentable by-products (Reis et al., 2011). A wide range of VFA (volatile fatty acids) are able to be taken up (such as acetate, propionate and butyrate), particularly those typically found in anaerobically fermented wastewater (Fradinho et al. 2014), and produce PHA copolymers (HB-co-HV) that reduce brittleness, increase processability and broaden the range of applications. To demonstrate PHA production through microalgae/bacteria bioprocesses treating WW using HRAP systems achieving a rate of 25 gVS /m2d and 0.4 PHA/kgVS. Agro-industrial waste and wastewater from fish canning, abattoir, winery, dairy, sugar etc.